THE PENTAGON — The cost to repair stricken destroyer USS Fitzgerald (DDG-62) will easily be more than the $250 million the U.S. Navy paid to repair USS Cole (DDG-67) after it suffered a 2000 terrorist attack in Yemen, USNI News has learned. While it’s too early to craft a complete repair estimate, several naval analysts told USNI News a $500-million bill to fix to the warship was not out of the question. According to three sources familiar with the early damage estimates, repairs to the extensive damage to the ship’s superstructure, spaces below the waterline, and pricey electronics and radar systems will cost more than repairs to the damage suffered by Cole after an explosives-laden suicide boat attack hit the ship pierside, blasting a hole in the waterline and killing 17 sailors. The June 17 collision of Fitzgerald and the Philippine-flagged merchant ship ACX Crystal off the coast of Japan resulted in the death of seven sailors, extensive damage to the hull, and damage to several high-end electronic systems, such as the integrated radio room on the ship and the starboard forward array of the ship’s A/N-SPY1D(v) air search radar. The port side of the flared bow of Crystal caved in the superstructure of the ship, crushing the radar face and twisting the metal of the superstructure. A Navy official told USNI News the assessment on Fitzgerald is ongoing and that an official estimate is still being developed by the service. The service is also debating on how to get the DDG back to the U.S. for repairs, though a heavy-lift ship transporting Fitzgerald to the West Coast is the current favorite option in Navy leadership circles. Cole was taken back to the U.S. by MV Blue Marlin, a heavy-lift transport for oil rigs, and repaired over a period of two years at what is now the Ingalls Shipbuilding yard in Pascagoula, Miss. “The repair process, which cost about $250 million, included removing and replacing more than 550 tons of steel, replacing two 27-ton main engines and modules, installing a new stern flap, which will increase the ship’s speed and fuel efficiency, replacing three gas turbines generators, and installing new galley equipment,” the service said at the time. 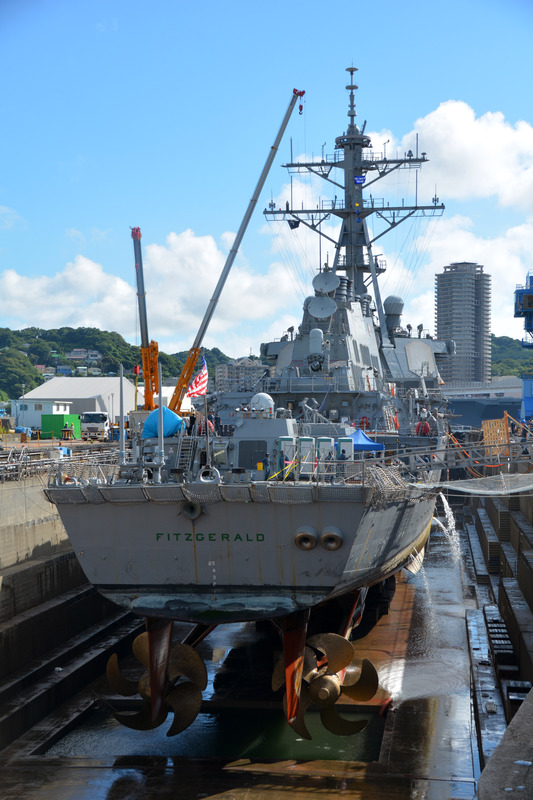 The biggest difference in cost will be the replacement and upgrading the electronics of Fitzgerald. “The Cole was largely engineering, and it’s electronics that gets you,” retired Navy captain and naval analyst Chris Carlson told USNI News on Wednesday. Additionally, the spaces that were flooded below the waterline would also need to be gutted, Carlson said. 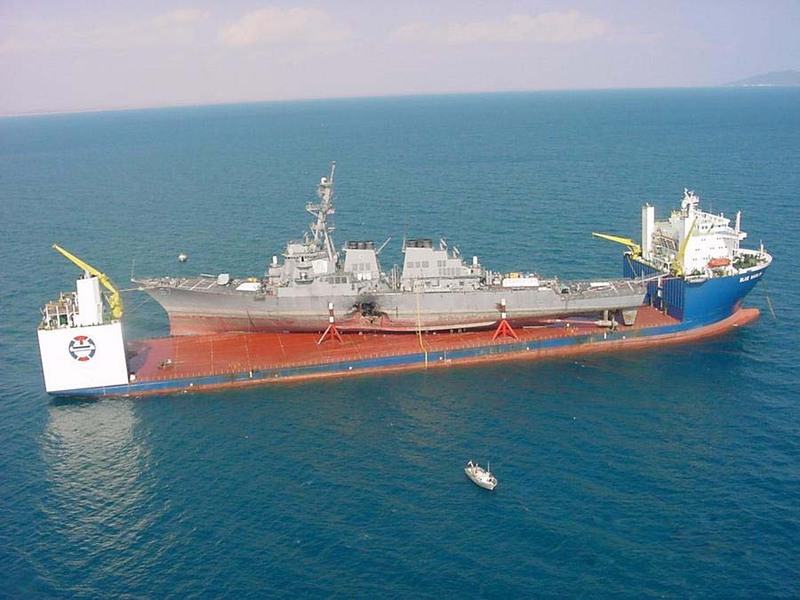 Bryan Clark, naval analyst with Center for Strategic and Budgetary Assessments, said, based on photos of the damage published by the Navy, the costs to repair the ship would easily top the $250 million of the Cole repairs, and could even double that figure. Fitzgerald, commissioned in 1995, is one of the earliest Arleigh Burke-class destroyers and was due for a $170-million basic hull, mechanical and engineering upgrade in Fiscal Year 2019, according to modernization information obtained by USNI News. The upgrade is meant to get an additional 10 to 15 years of life out of the hull. However, the Navy will probably elect to upgrade the damaged electronics to the new Baseline 9 standard that allows warships to both target ballistic missiles and fight traditional air warfare threats. That overhaul costs about $270 million. “That makes the repair-plus-overhaul several times more expensive than originally planned. The problem will still be, what work won’t get done on other ships to pay for the repair?” Clark said. While there are several unknowns around the repair schedule, the Navy has said it was committed to repairing the ship. “The ship is salvageable,” U.S. 7th Fleet commander Vice Adm. Joseph Aucoin told reporters on June 17, Stars and Stripes reported. While the repair plan is ongoing, several investigations continue into the cause of the June 17 collision off the coast of Japan.